As you can probably imagine, the club's legendary foreign tours were still a few years off and so the first tour the Corinthians undertook was to the north of England. It was a significant event in the club's history not just because it set a precedent which is still adhered to today, but because it firmly put the club on the footballing map. Of the 114 matches played between 1884 and 1890, 68 were played on the Northern Xmas tours. As already noted, the 1884 tour sealed the reputation of the club, practically while it was in progress. It was by no means an easy tour with seven tough games in eight days. Blackburn Rovers were the toughest opponents and were the current holders of the FA Cup, a feat they managed to achieve in three consecutive years. In the absence of league football, they were regarded as Champions of England. The Corinthians fielded their strongest side and thrashed the cup holders 8-1, largely due to the speed and accurate passing of the Corinthian forwards. The result not only inspired interest in the tour but also created instant recognition of the club as one which had come to play and could compete with the best. The side that represented the Corinthians that day: M.J.Rendall, A.Watson, W.F.Beardshaw, A.Amos, C.Holden-White, F.E.Saunders, F.W.Pawson, B.W.Spilsbury, Dr J.Smith, W.N.Cobbold and T.Lindley. ​This was followed by matches against Darwen (who would soon appear in Division One of the Football League), Blackburn Olympic (FA Cup winners only a couple of years previously), and then a win over the oldest club in the world Sheffield FC. After five matches in five days, Bolton not surprisingly inflicted a 7-0 defeat on the tourists. The club though was resting several players for the tough match against Preston North End the following day. A crowd of 10,000 gathered for the match which the Corinthians lost 1-3 in a fine game. The Corinthians first ever foreign tour came in the Summer of 1897, when the club visited South Africa. It resembled in style a cricket tour as 23 matches were played and 21 were won. The tour started in Cape Town with two 4-0 wins and a 5-0 victory over Western Province. Then the side then travelled a gruelling 900 miles to King Williams Town, however the travel did not effect the side and a 6-1 win followed. It was not until the ninth match of the tour that the tourists suffered a draw, against Old Natalians. This was followed by a 9-0 win over Pretoria before the first test match against South Africa. Corinthians won 3-0 thanks to Topham and Stanborough being in top form. ​The second test was much a much easier affair with the tourists winning 4-1. This was followed by the second low point of the tour when Natal held the tourists 2-2. Griqualand were then smashed out of sight in a 10-1 the first and only time Corinthians made double figures on this tour. During the tour the Corinthians scored 113 goals and just 15 were conceded. It was a fine achievement since only fourteen players under took tour. Few wholly escaped the effects of hard grounds and long journeys and the heavy programme told on everybody. 1903, the team sailed from Southampton on the Dunnottar Castle arriving in time for the first match on 2nd July. The club again was due to take on a mammoth tour which consisted of 25 games, all of which were won, but for two drawn matches with Johannesburg and Bloemfontein and a defeat against Durban. The record was not quite as good as the 1897 tour, but football had improved greatly in the intervening years. The interest in football had grown as well and large crowds gathered at the various grounds. The tour started well with an 8-2 victory over the Colonial Born and was followed up with a win over Western Province. It was not until the twelfth match that a defeat was suffered at Durban. Reports state it was a poor and uneven ground although bad finishing was the main culprit. It made little difference as the side bounced back with a 1-0 win at Natal two days later. It was the first of eleven straight wins, which culminated in a 4-0 win in the test match with South Africa. In Easter 1904 the Corinthians visited Austria-Hungary for their first tour on mainland Europe. It only came about ironically after G.O.Smith and W.J. Oakley's attempt to organise a American tour collapsed. So on the recommendation of the Oxford and Cambridge University teams who had both visited Hungary, it was decided that it would be better than a west of England tour. The first match in Budapest played before a large crowd was against Magyar Testakortok and resulted in an easy 6-0 victory. This was followed by a 9-0 thrashing of Budapesti Torna Club and bettered still by a 12-0 win over Magyar Athletikai Club. The Corinthians were so impressed by the hospitality and spirit of their Hungarian hosts that they donated a trophy, The Corinthian Cup, which became the centre-piece of an annual tournament competed amongst Budapest's top amateur teams for the next three decades. ​After these games the club departed for Vienna. It has to be remembered that Vienna, like most of modern Austria, was part of the Austro-Hungarian Empire at this time. Vienna were beaten 7-1 before the club moved onto Prague. There, Slavia FC were encountered twice and beaten 7-4 and 4-1, they were much stronger opposition that the previous games, having played the game longer than those elsewhere. The final game of the tour was against VfB Leipzig and despite only having twelve fit players a 4-1 victory resulted. A trip into the unknown was the best way to describe the 1904 tour to Scandinavia. At that time little was known about Scandinavian football. The trip was organised by Mrs Wreford-Brown who also travelled with the party. Most the pitches in Sweden at this time were gravel and it was common place during winter to flood them and use them as ice rinks. This failed to deter the tourists as Goteburg were defeated 6-0 in the first match.By lake, canal and rail the tour continued to Stockholm where three games had been arranged at Edrotts Park, a pretty ground, although the pitch was grassless. ​The first match against Stockholm saw the Corinthians win 11-0 with Moon hitting an impressive eight. The second was not an official game and the two sides split up their players to make it more of a contest. The last game finished with a 14-1 victory, with Moon 5, Bryant 4 and McIver 4 recording good scores.Next stop was Copenhagen and the pitches were found to be of a much higher standard. The standard of opposition mirrored this and both games were won 4-1. The side that travelled to the Canada and the U.S.A. was probably the finest Corinthian team to ever leave these shores. Upon arrival at Quebec, the team learned that through some error, no rooms had been reserved, but fortunately an Old Carthusian whom they had met on board, rescued the situation and took the tourist to stay at his house. The first game followed and due to a train delay, the side were an hour and a half late, and the large crowd of 3,000 seriously doubted whether they would turn up. Four victories followed before Huron's, the champions of Canada held the side to a draw. ​The side travelled down to Chicago to begin the American leg of the tour, a 5-2 victory followed over the local side. Next came Cincinati in what turned out to be a record 19-0 win, with S.H.Day scoring seven. This was achieved despite the side losing all it's luggage in transit and thus new outfits had to be obtained. Further convincing wins followed, the largest being against All New York who were demolished 18-0 with S.H. Day again leading the way with nine goals. The first and only defeat occurred in their penultimate game when Fall River defeated the tourists 0-3. By this time however they were down to twelve players. The last game finished in a 1-1 draw. In Easter 1906 the Corinthians toured the continent once again. W.U.Timmis had arranged two matches in Berlin and two in the Hague. The first match in Berlin was against Germania F.C. and on arrival a large crowd had assembled. It was a hard and uneven pitch, but was larger than previously encountered abroad. The game itself was won easily 11-0, G.S. Harris hit four goals in this match. Next were Victoria F.C. who were thrashed 12-1. The tourists next visited the Hague and found that Dutch football was at a much more advanced stage than in Berlin. The first match was won 5-1 against The Hague and the local side were really fast, and their forwards played the long passing game with great dash. The last match of the tour was against Holland, a side would that would have tested a Football League team. All the players were speedy, had an excellent idea of the finer points of the game, and at the same time played in bustling style. After a tough match the Corinthians triumphed 2-1 to complete a successful tour. 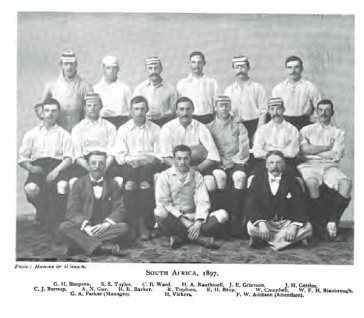 After the controversy resulting in the formation of the Amateur Football Alliance, a large number of foreign tours took place between 1907 and the war, the first was to South Africa. The tour itself was almost identical to the two previous tours to that country. The country had made great strides in the intervening years and it was by far the toughest foreign tour the club has ever encountered. After being unbeaten in 1897 and only suffering one defeat in 1903, five defeats were endured and seven draws. It is significant however that all five defeats took place at the start of the tour while the tourists were still acclimatizing. The highlights of the tour were the test series. The first was won 2-1 with goals by Cornelius and Brisley. A brace by Cornelius saw a 2-0 win in the second game before in the final game ended 1-1 with Brisley scored. The Easter tour of 1908 to Paris was a short one, with only four days away and three matches played. The three matches resulted in a convincing goals for tally of 21 to 3. The first game was played at Colombes and with Herman, Pollock-Hodsoll, Timmis and the two Morgan-Owens were in great form and a 5-1 victory resulted. The second game with only one change to the starting line up had an easy victory of 9-0 over Standard Athletic. A rest day ensued before the Outcasts were beaten 7-2 on the first occasion on which two good class English sides had met ever met in France, the Corinthians won due to better combination play. At the interval the Corinthians were losing 1-2. The second half saw the forwards awake and rattle in six second half goals. Easter 1909 saw the club visit Prague and Switzerland and resulted in another successful tour. The first match was against Slavia Prague and resulted in a draw. An odd incident occurred during the game when in the last minute with game goal less, the Slavia Prague outside-right kicked the ball against Braddell's shoulder. The referee at once pointed to the penalty spot, the referee then had to with stand much heated argument from both the Corinthians and the Prague eleven, who also felt the penalty was unnecessary. Meanwhile the 15,000 crowd waited eagerly for the Corinthians first continental defeat. At length, Braddell could stand the suspense no longer; he rushed up grabbed the ball, faced the crowd and glared his defiance at the referee, who immediately blew his whistle for full time! The unbeaten record had been preserved - but only be something that looked suspiciously like subterfuge! On the following day against the same team the Corinthians won 3-1. In Geneva the authorities heard that tea was acceptable at half time and so in order to demonstrate their desire to do everything possible for such a club as the Corinthians, an enormous meal was prepared and the tourists were respectfully asked if an interval of three-quarters of an hour was sufficient! Five memorable tours and one of our main claims to fame have resulted from the connection. The claim to fame is obviously that SC Corinthians Paulista, the twice World Club Champions take their name from us as a result of the 1910 visit, and the strong connection that continues between the clubs can be verified by many our members who have been fortunate enough to visit Brazil since then. The connection started in 1910 when the Corinthians took a strong side to Brazil leaving Southampton on 5th August. They reached Rio on the 22nd August and played their first game two days later against Fluminense. The score ended up 10-1 with Vidal scoring four, Day three, Brisley two and Thew getting the other. The next game was against a Rio XI and saw Corinthians score eight to their opponents' one. Coleby hit six goals in this match. Interestingly the next day a Cricket match was played against an English Cricket Club and ended in a draw. The final match in Rio was against a picked Brazilian National team and saw a much tougher game end in a 5-2 win for Corinth. The club then moved to Sao Paulo and although the conditions were not as good, mainly due to the small pitches, the Corinthians won all three games. The closest was against Palmeiras and ended 2-0. Paulistano were beaten 5-0 and Sao Paulo AC were beaten 8-2. Charles Miller, the man credited with taking football to Brazil, scored one of the SPAC goals that day. Corinthians toured Canada and America in the Summer of 1911 and played 21 games. Nineteen of these were won and the other two resulted in a draw and a loss. Starting in Toronto, they recorded their first victory over the locals 2-1, before suffering their first and only defeat 1-3 at Ontario. Gradually the tourists worked their way across the continent to Vancouver Island. The tour aroused tremendous enthusiasm through out Canada, the forward play of Bache, Brisley and Day being particularly appreciated. Bache scored 38 goals in just 18 games, an amazing effort for such a long tour, with grounds being not of the highest standard. It is significant that the only match lost was when Bache, Brisley and Morgan-Owen were being rested. The fine play of certain Corinthians was still remembered when the next visit to Canada was made in 1924, when, unfortunately a side not truly representative of the clubs strength was unable to maintain the high standard set in 1911. The last match of the tour saw a record equalling 19-0 win over Cricket Club. Brace 4, Brisley 4 and Maples 3 were the principle scorers. Another big win saw Corinthians beat Chicago 10-1 with Brache hitting seven. For Easter 1911, the Corinthians sent a side to play three matches in San Sebastian. The first match was against another touring side London Nomads, a team composed of members drawn from several Amateur Football Association clubs. An appreciative crowd of 3,500 saw the Corinthians win 7-0, Birks being the star with four goals. The Corinthians fielded a weaker side for the second game against San Sebastian, and with the forwards missing numerous chances, they were only able to win 3-1 with goals from Young, Birks and a own goal. The third and last game was a return game against the London Nomads and another easy victory resulted. Bache hit a hat trick as the side ran out 6-0 winners. The Corinthians thus became the possessors of gold medals given by the Grand Casino de San Sebastian for the winners of this triangular tournament. In Easter 1912, the Corinthians visited Prague. The party left London on 4th August and played five games in Bohemia, three in Prague to two in Brunn. The club traveled without anyone equipped to play full back and this naturally proved a severe handicap. The first match resulted in a commanding 5-1 win over Slavia Prague with Bache scoring four. It was however a lot closer than the scoreline suggested and the strength of the Prague club can be seen in the second match when Corinthians lost their first ever game on the continent 1-3. It was however largely influenced by the referee who objected to any charging whatsoever, and after conceding two penalties there was no way back. The third match saw Corinthians fairly and genuinely beaten by a strong Bohemian XI. The Corinthians then traveled to Brunn and on a poor ground, easily won 9-2 with Bache again scoring four and also maples hit a hat trick. The last game saw a 3-1 win over Moravia with Bache, Coleby and Young scoring the goals. It was an enjoyable tour by all accounts and the Corinthians were treated royally. Corinthians returned to Brazil in 1913 and had one of the most adventurous journeys ever taken by the club. In his history of the club, Creek states the voyage was enlivened by a wedding, a birth, two deaths (one a suicide) and the escapades of a cook who suddenly went mad. Corinthians played Rio de Janeiro in their first match. Despite a Woosnam goal Corinth went down 1-2 to what was their only defeat on the tour. Hoffmeister scored all four in a 4-0 win over Estrangeros. The final game in Rio saw Corinthians beat Brazilieros 2-1. In Sao Paulo, Corinthians won two games against MacKenzie College and Paulista before being held by Palmeiras. The crowds on this tour were all between 6,000 and 10,000 which highlighted what popular visitors they were. ​Corinthians returned the following year, but this can not really be classified as a tour. Due to the war starting, football was quickly forgotten and the scheduled matches cancelled. Four members of the side had to return immediately to England as they were part of the Reserve of Officers and did so at Pernambuco. When the rest of the party reached Rio, they had just about enough time to visit the ground before they too returned home. At one point the ship even had to alter course to avoid a German gun boat. The first Corinthians tour abroad since the end of the First World War was a short but very pleasant trip to Paris and Lille. In the course of a brief weekend , two matches were played and won against Red Star and Olympique Lillois. The party travelled via Dover and Calais to Paris where they stayed in the Hotel Grande Bretagne. The first match against Red Star was played on one of the worst grounds imaginable. There was not one blade of grass to be seen on the playing pitch, which, in addition to being very small, was covered with small stones and bits of glass. A light ball which bounced a great deal made it an altogether terrifying experience. Corinthians though attacked through out the game with Beeston scoring in the first half and C.T. Ashton scoring a second before a late Red Star consolation. Overall it was a good performance when you take into account the conditions underfoot, the heat and the fact that Red Star were the Coupe de France Champions. 5,000 people attended the match. ​The following morning the party travelled to Lille, where they were only given time for a hurried lunch before playing Olympique Lillois. The ground was a major improvement on the one in Paris and the Corinthians were able to do themselves full justice. Thanks to the conditions the game was much faster and more skilful and in the second half the Corinthians put on a superb exhibition. The side left almost immediately after the game and arrived back in London on the Tuesday. Easter 1922 saw the club visit Denmark and Holland. The party left Harwich and that evening on the Kong Haakon enjoyed an excellent dinner which was followed by a sing along with Doggart on the piano. The first match took place on Good Friday against a combined Copenhagen XI before 25,000 spectators. A 5-0 win resulted with the Corinthians rarely troubled. On Saturday the side attended a race meeting, where Coles was nearly arrested for acting as the sides private book maker when signs strictly prohibiting any betting except at licensed bookies were posted everywhere. Sunday saw the second match and a slightly weaker Corinthians side won 3-1. All three inside forwards scored, they were Foster, Creek and Doggart. The side had another day in Copenhagen before departing for Holland. There first match was against Be Quick FC the Dutch Champions for 1919/20 and won more comfortably than the 5-2 score line suggests. The next match was played at the Hague against a combined Dutch Universities XI. The referee's interpretation of the rules caused a little trouble, but the Corinthians eventually won 5-3. The last match took place in Amsterdam at the Swallows magnificent stadium and resulted in the best game of the tour. An enormous crowd saw the Corinthians lose 0-1. The Swallows played fine football and whilst the Corinthians defence was in good form the forwards never really got going. The Easter 1923 tour came about almost entirely due to G.N.Foster who was closely connected with the Belgium clubs immediately after the First World War when he was organiser of sports for the British Expeditionary Force. The side though was weakened for the first half of the tour by the fact that Easter fell early and thus prevented the schoolmasters, who had formed the backbone of many touring sides were unable to go. Combine this with the absence for varying reasons of Doggart, Hegan and C.T.Ashton and it is not surprising the side did not do well. The first day saw a game of golf at the Royal Belgian Golf Club. The opponents faced included Prince Edmond Ruspoli of Italy. The Corinthians won the foursomes 2 games to 1 and the singles by 4 to 2. 35,000 people witnessed the first game against Daring FC and the Corinthians went down to a fourth minute goal and then defended for the rest of match against the speedy Belgian forwards. The next two matches against Union St.Gilloise on Easter Monday and Willem II saw the Corinthians badly beaten. The half-backs and forwards were completely outclassed in these matches. The party then travelled to the Hague and were joined by Hunter, Blaxland and Creek who had flown in from Croydon. The first match in Holland was against a combined Dutch University XI and before 6,000 people two goals by Creek were enough to start the Dutch leg of the tour with a win. ​Next stop was Amsterdam where the Corinthians faced Swallows before 30,000 people, Creek again scored twice to seal victory. At the reception afterwards Miles Howell who had shown remarkable form at one of the Brussels night-clubs by giving a most amusing solo turn and then going round with the hat, was again well to the fore with a perilous juggling exhibition. The party travelled to Rotterdam for the last game by racing car! The drivers of which vied with each other in the speed at which they took the many hair pin bends across the canals. Not surprisingly the last game was lost 1-2, but by this stage several of the tour party had returned to England. This was the last of the Corinthians mammoth tours and lasted for 22 games and was six weeks long. It was hardly the most successful of tours as the touring party won ten, drew four and lost eight. It should be observed that six of these defeats came in the first nine games and all came on Canadian soil. The Corinthians how ever had a small squad and were immediately hit by injuries to Morgan and Robinson. On top of this many of the star players were unable to make the trip including a recognised goal keeper. It was muted that had Howard-Baker made the trip, then all but two games would been won. In the United States the football was not particularly exciting and the side played five games, four of which were in Philadelphia. The sides in America were mainly made up of young graduates and students of universities, all of which were a lot less experienced than the Canadians. In the middle of the Philedelphia stay the party made a lightening trip to play Brooklyn in New York and a draw resulted. In April 1925, The club embarked on a brief tour of Germany and Austria, playing four matches over the course of six days. They began in Cologne where the hosts were beaten 4-2. The Corinthians then travelled up to Hamburg for an Easter Sunday match against the current German champions. A Creek hat-trick contributed to a comfortable 4-1 win. The following day, the team travelled to Berlin where they met stronger opposition in a 1-1 draw against Berliner Tennis Club Borussia (better known today as TB Berlin). After a day of sight-seeing, the touring party departed for Vienna where a huge crowd assembled to greet them at the railway station. The match itself was witnessed by an enthusiastic crowd of more than 50,000 who saw a picked team of Vienna's best professional players win 2-0, although this was partly due to the game being played according to some rather odd local rules and the presence of a peculiarly light and undersized football! On 4th April 1928, a party of 13 Corinthians set out on tour in Denmark and North Germany. Many were the greetings exchanged with old friends when the Danish capital was safely reached, and the Corinthians were assured that their hosts had profited considerably from their earlier visit and would now give them some hard games. This optimism was thoroughly justified. The first game against Bold Klubben 1903 saw a 1-1 draw result, a fitting score to a hard game, in which defence was much stronger than the attack. Glenister scored for the Corinthians with a magnificent drive from 30 yards out in the first half; but unfortunately knight was so badly injured after the interval that he had to retire to bed and played no further part on the tour. Against the ten men, the Danes played very good football, and the Corinthians did well to make a draw. As German was just recovering from a knee injury, an improvised forward line appeared in the second match, and although Lowe scored a fine goal, the Corinthians were well beaten 6-3. After these somewhat unworthy games at Copenhagen, a brief visit was paid to Odense. With no one else available, both Hunter and German had to play. German hardly touched the ball, but once nearly scored a goal by bustling the goal keeper over the line. Hunter, on the other hand, played spendidly, and with Chadder again in fine form, the first victory of the tour was won. In the evening the party went to a play, but as they were unable to understand it; came out after about ten minutes and tried something more easily comprehensible - a circus, held in an enormous tent. By this time the masseur was a busy man. The hard grounds had given everyone slight injuries, and, as the Club only had the bare minimum of players on tour, it can easily be understood how gladly the reinforcements were welcomed at Hanover. With Ewer and AG Bower strengthening the defence, Chadder was moved up into the forward line to partner Robins, and the Corinthians won a rather poor game, the chief excitement being caused by the news that a German aeroplane had flown across the Atlantic! ​From Hanover the tourists proceeded to Hamburg, where they had excellent head quarters opposite the Alster, the famous inland lake. The best match of the tour was undoubtedly the last one against Hamburg. The German team all looked didly fit and included an international centre-forward who really was a first class player. However, the two Bowers at full back were in great form, and the defence refused to yield a goal. The inside forwards, it must be admitted, were weak and as they failed to score, a stern game resulted in a goal less draw. Considering the handicaps of injuries and shortage of players, the side did well to return home after a thoroughly enjoyable tour with a record of two matches won, two drawn and one lost.